Az Abaliget turisztikai alkalmazás célja, hogy a községnevezetességeit és látnivalóit okostelefonjukon is elérhessék atelepülés iránt érdeklődők. Az applikáció ízelítőt nyújt Abaligetnövény és állatvilágból, megismerhetjük történelmét, illetve egytérkép segítségével a község vendégeinek sétaútvonalakat isfelkínál.The application is designed Abaliget tourism to thevillage's sights and attractions on their smart phone can reachpeople interested in the settlement. The application provides ataste of Abaliget plant and animal world, learn about history and amap of the village will offer guests walking routes. For Serious Travellers and First Time Visitors Alike. Budapest: aCritical Guide is an unusual, cult app— possibly the truest, mostpersonal, and funniest insider’s city guide ever written about anymajor city, updated as often as necessary, by Budapestauthor/historian András Török. Szlovákiai magyar hírportál - hírek,cikkek,tudósítások és egyéb információk. 2006-os indulása óta azegyiklegolvasottabb szlovákiai magyar független hírforrás,amelyelsőként jelent meg mobil platformokon.Hungarian news portalinSlovakia - news, articles, reports and other information. Sincethelaunch in 2006 of one of Hungary's most widely readindependentnews sources in Slovakia, which first appeared onmobileplatforms. Az alkalmazás béta verziója tölthető le, ha hibát talál, kéremjelezze a fejlesztőknek, ezzel is segítve munkánkat.A Közigazgatásiés Elektronikus Közszolgáltatások Központi Hivatalának alkalmazása,amelyben az okmányirodák elérhetőségei és a bennük intézhető ügyekrészletes leírásai mellett a felhasználó időpontfoglalást isindíthat okostelefonján.Az app funkciói:• Foglalás: Az ügytípusokkiválasztása után a felhasználó a 10 legközelebbi irodába foglalhatidőpontot. A sikeres foglalás végén útvonalat tervezhet az irodába,az időpontot pedig elmentheti a telefon naptárába.• Térkép: Azokmányirodák térképes megjelenítésében könnyen áttekinthetőek amagyarországi irodák.• Irodák: Az okmányirodák részletes adatai,elérhetőségei. A felhasználó az iroda elérhetőségeit egykattintással elmentheti a telefonkönyvébe, közvetlenül hívhatja ésútvonalat is tervezhet hozzá.• Ügyleírások: Az okmányirodákbaintézhető ügyek tömör, áttekinthető leírásai.The beta version ofthe application is available for download, if you are, pleasecontact the developers, helping our work.The Administrative andElectronic Public Services Central Office application in which thedocument offices and their contact details can arrange for detaileddescriptions of cases, the user can also start booking datessmartphone.The app features:• Book: The types of cases the userafter selecting the 10 nearest office booked. The book at the endof a successful plan a route to the office, you can save your timeand your phone calendar.• Map: The map display office documentseasily in transparent offices in Hungary.• Offices: details of theregistration offices and contact details. The contact details ofthe office user with one click you can save in the phone book, justcall and plan a path for him.• Ügyleírások: The okmányirodákbatransacted affairs concise and clear descriptions. A Magyar Nemzeti Galéria hivatalosalkalmazása.Töltse le az alkalmazást és fedezze fel a Galéria állandógyűjteményeinek és időszakos kiállításainak kiemelkedőműtárgyait.A tárgyakat szöveges leírások és gazdag fényképanyag mutatja be azérdeklődőknek.Official use of theHungarian National Gallery.Download the application and explore the Gallery permanentcollection and temporary exhibitions of outstanding workitems.Textual descriptions of the objects and rich photographic materialpresented in the visitors. Töltse le a Nemzeti Sírkert alkalmazásátokostelefonjára és fedezze fel segítségével a Fiumei úti nemzetisírkertet!A magyar történelem, művészet és tudomány valaha élt legnevesebbképviselőinek sírhelyei részletes leírásokkal és fotókkalillusztrálva találhatók meg az alkalmazásban, melyek a beépítetttérkép illetve Kiterjesztett Valóság funkció segítségével könnyedénmegtalálhatók.Csatlakozzon az app által kínált virtuális idegenvezetéshez ésinduljon el a Nemzeti Sírkert által kínált tematikus túrákvalamelyikén!Download the applicationto the National Graveyard smartphone and explore using the nationalFiume Street graveyard!Hungarian history, art and science ever lived most prominentrepresentatives of the Tombs illustrated with photos and detaileddescriptions can be found in the application, which the built-inmap or Augmented Reality feature allows you to easily find.Join offered by virtual guided tour of the app and start offeredby the National Graveyard themed tours in one! Tokat Belediye Başkanlığı Mobil Yazılımı ile belediye artıkcebinizde.Tokat Municipality municipality mobile software is now inyour pocket. 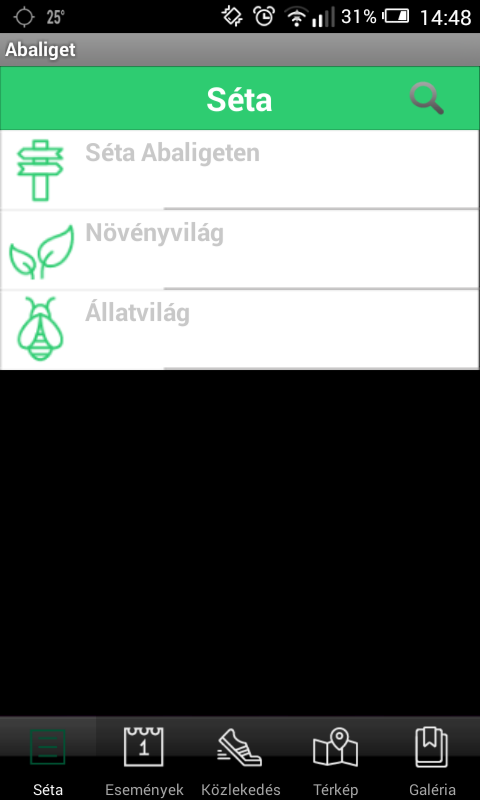 Időkép's official Android app and widget. - live weather maps forHungary - high resolution radar - storm alerts - webcams -lightning map If you'd like to know what weather should you expectwhen you get home, or to the beach - anywhere in Hungary, you needto search no more. This app will provide you with precicese weatherforecasts, display weather conditions on the country's map, now ina more comfortable way. Using this app you'll be able to shareweather condition and events, upload weather related photos easily.Be the first to report about the most interesting weatherphenomenas. A TV24 új verziója több mint százharminc tévécsatorna részletesműsorát tartalmazó személyre szabható TV-műsor, melybenkiválaszthatod kedvenc csatornáidat, választhatsz műsort téma,időpont alapján, az értesítéseknek köszönhetően pedig soha nemmaradsz le a kedvenceidről. TV-műsor most, ma este, holnap vagyakár a következő két hétben bármikor! • Extra tartalmakkalkiegészített műsoradatlapok: nézd meg a szereplőket, válaszd ki akedvencedet és nézd meg milyen műsorai lesznek a következő kéthétben • Tovább bővült csatornakínálat: több mint 130 csatornaműsora két héttel előre • Személykereső, ahol színészekre,stábtagokra keresve találhatod meg a neked való filmet, TV-műsort •Hangulat alapú kereső, ahol elég megmondanod, hogy milyen típusúműsort néznél, mi megmutatjuk, hogy hol találod, csak kattint akeresés gombra • “Megfigyelem” funkció, ami szól, ha újra adják akedvenc műsorod, ehhez használd a keresőt, majd a kiválasztottműsor adatlapján a Megfigyelem funkciót • Magazin és ajánló oldal alegfrissebb tévés hírekkel • Teljesítmény-optimalizálás • Pushértesítések • Facebook login • Offline működés • Animációk • Mégtöbb cikk a Magazin alatt Az alábbi TV csatornák közülválaszthatsz: M4 Sport, TV2, ATV, RTL Klub, RTL, HírTV, CartoonNetwork, Echo TV, Spíler TV, Sport1, M1, Film+, Viasat3, SuperTV2,Eurosport,Izaura TV, HBO, Nickeloden, Boomerang, Disney Channel,National Geographic, Comedy Central, Euronews, Digi Sport 1, Mozi+,FEM3, FOX, MTV, Galaxy, Viva, M5, Duna, Paramount Channel, SkyNews, M3, TV Paprika, Story 4, Viasat6, Film Mánia, AMC, Travel,M2, Digi Film, Duna World, Fix TV, RTL Spike, Film Café, ZDF, Cool,Humor, AXD, Eurosport 2, Digi Sport 2, ARD, History, Nick Jr., TLC,Spektrum, Filmbox, Muzsika TV, Sláger TV, Story5, Bonum TV, Film 2,Prime, Hustler TV, Megamax, Blue Hustler, Hatoscsatorna,OzoneNetwork, Cinemax, Discovery Channel, Chili TV, Sport2, RTL II,Kiwi TV, Spektrum Home, Sorozat+, Zenebutik és még sok más. Válaszdki előre kedvenc TV-műsoraid, hogy értesíthessünk a kezdetük előtt:Nagy Duett, Híradó, Barátok Közt, Konyhafőnök VIP, Éjjel-nappalBudapest, Tények, Vigyázat, gyerekekkel vagyok!, Szulejmán, FókuszPlusz, Delfines kaland, A mi kis falunk, Keresem a családom,Milliós játszma, Fókusz plusz… Vagy kereshetsz kedvenc színészeidalapján: Jennifer Lawrence, Angelina Jolie, Brad Pitt, Johnny Depp,Leonardo DiCaprio, Carmen Miranda, Emma Watson, Jared Leto, TomCruise, Marilyn Monroe, Arnold Schwarzenegger, Sylvester Stallone,Sandra Bullock, Harrison Ford, Will Smith, Natalie Portman, AnneHathaway, Tom Hanks, Cameron Diaz, Julia Roberts, Robert de Niro ésmég sokan mások. Illetve filmkategóriák alapján: Akció film,animációs film, családi film, dokumentumfilm, dráma, kalandfilm,krimi, magazin, reality, romantikus film, sci-fi, show, thriller,történelmi film, vígjáték, western, zene, zombis, sport. TV24 – theTV guide for Android With the new TV24 Android app you can browsethe programme of more than 130 television channels. The applicationhighlights currently running programmes and notifies you beforeyour favourite programme starts. You can share what you arewatching on Facebook, reorganize the channel-list or browseTV-news. The application is available in Hungarian only.Customizable TV programs containing more than one hundred thirty-TVchannel TV24 detailed program of the new version, in which you canselect your favorite channels, you can choose programs based ontopics, time, thanks to the notifications and never miss in yourfavorites. TV show right now, tonight, tomorrow or even the nexttwo weeks at any time! • Extra sheets with program content: a lookat the characters, choose your favorite and see what will be thenext two weeks broadcasts • More expanded channel offers more than130 channels show two weeks in advance • Person Finder wherelooking for actors, crew members can be found for you in the movie,TV show • Mood-based search, which is enough to tell what type ofprogram would look, we'll show you where to find it, just click thesearch button • "watch list" function, which is when you give backthe favorite beer, to use the search engine, then the selectedtrack data sheet of the Observatory function • Magazine page andoffering the latest TV news • Performance Optimization • Pushnotifications • Facebook login • Offline operation • Animations •More Articles in Magazine under The following TV channels to choosefrom: M4 Sport, TV2, ATV, RTL Klub, RTL, HírTV, Cartoon Network,Echo TV, RocknRolla TV, Sport1, M1, Film +, Viasat3, SuperTV2,Eurosport, Izaura TV, HBO, Nickelodeon, Boomerang, Disney Channel,National Geographic, Comedy Central, Euronews, Digi Sport 1, Cinema+, FEM3, FOX, MTV, Galaxy, Viva, M5, Danube, Paramount Channel, SkyNews, M3, TV Paprika, Story 4, Viasat6, Movie Mania, AMC, Travel,M2, Digi Film, Duna World, Fixed TV, RTL Spike, Zone Romantica,ZDF, Cool, Humor, AXD, Eurosport 2, Digi Sport 2, German, History,Nick Jr., TLC, MS, Filmbox, Music TV Hit TV Story5, Bonum TV, Movie2, Prime, Hustler TV, Megamax, Blue Hustler, Six-Channel,OzoneNetwork, Cinemax, Discovery Channel, Chili TV, Sport2, RTL II,Kiwi TV, spectrum Home, Series +, Music Boutique and much more.Choose your favorite TV shows in advance to notify Before theBeginning: I'm a big Duet, News, People private, executive chef,day and night, Budapest, Facts, Caution, children !, Suleiman,Focus Features, Dolphin Adventure Our little village is, I'mlooking for my family, Millions game, focus plus ... Or you cansearch based on your favorite actor: Jennifer Lawrence, AngelinaJolie, Brad Pitt, Johnny Depp, Leonardo DiCaprio, Carmen Miranda,Emma Watson, Jared Leto, Tom Cruise, Marilyn Monroe, ArnoldSchwarzenegger, Sylvester Stallone, Sandra Bullock, Harrison Ford,Will Smith, Natalie Portman, Anne Hathaway Tom Hanks, Cameron Diaz,Julia Roberts, Robert de Niro and many others. And based filmcategories: Action movie, animation, family movie, documentary,drama, adventure, thriller, magazine, reality, romantic film,sci-fi show, thriller, historical, comedy, western, music, zombie,sport. TV24 - the TV guide for Android With the new Android app youcan browse TV24 Program of the more than 130 television channels.The application highlights Currently running Programs and notifiesyou before your Favorite program starts. You can share what you arewatching on Facebook, reorganize the channel list, or browse TVnews. The application is available in Hungarian only.